Apple products come preinstalled with an email client that can, on occasion, be quite smart. Today we want to show you another great feature: suggestions for event and contacts. Apple Mail has a lot of nice things going for it. For example, you can easily markup attachments and send them back to the original recipient, and then there are Smart Mailboxes, which let you sort email into special “smart” mailboxes without actually moving it from its original location. The idea behind event and contact suggestions is simple and not entirely new or original, but quite convenient and powerful. We like it because it makes short work of what has typically been a fairly tedious process. To illustrate what this feature entails, let’s see an example in an email. Here’s an address included at the tailend of a message we received the other day. If we hover over the address, a small arrow indicating a dropdown menu appears. Clicking on that arrow spawns the following dialog, which gives up three options, we can open the address in Maps, create a new contact, or add it to an existing one. If you decide to open an address in Maps, it will then let you get directions to it from your current location. 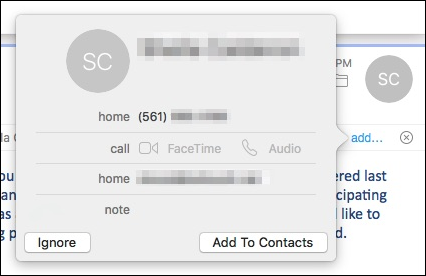 The nice thing is, utilizing this contact-adding method doesn’t even spawn the Contacts application. We can perform the procedure simply and easily from Mail, then go back to attending to our email. 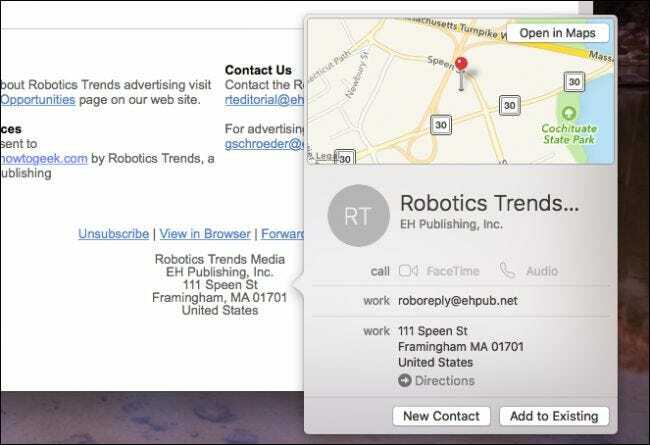 In some cases, Mail already knows when an email contains a contact and will alert you at the top of the message. If you click the “Add” button, it will again let you add it to your contacts without first needing to open the actual Contacts app. Here’s another example, this time with an event. In this message, there’s a date and time, which when hovered over with the mouse pointer, again shows us an arrow. You don’t actually need to highlight the date and time, Mail already knows what to do. Clicking that arrow will then let us add it to our calendar. At the very least, you might want to add a title to the event, but you can also add or fix the location details and the calendar to which it will be assigned. If you click the “Details” button however, you can add further details particularly the location, but also to add an alert, invitees, and notes or attachments. 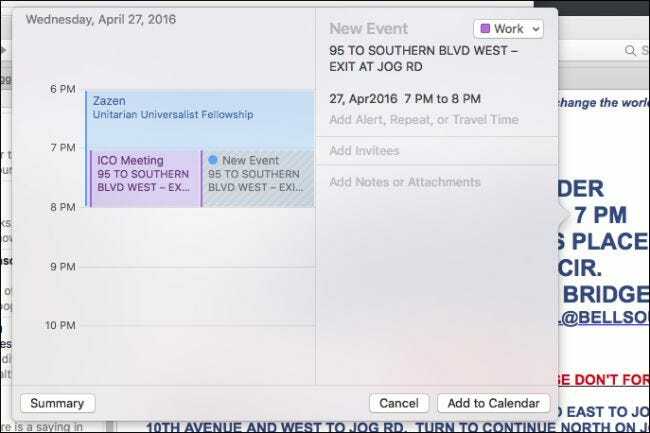 Similar to adding contacts, if you receive a message and it detects an upcoming event, you will have the option to add it to your calendar using the “Add” button. 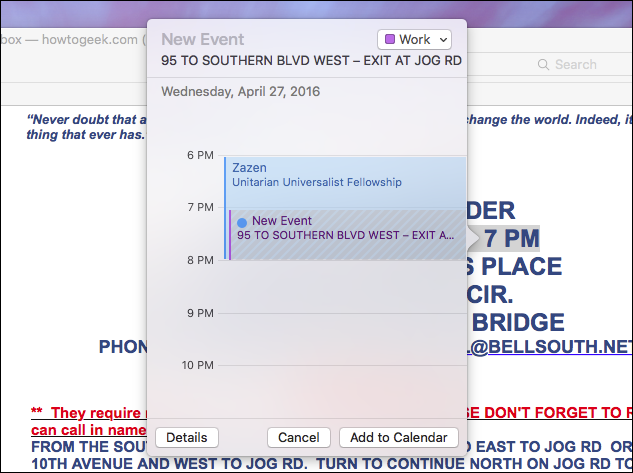 And, just like before, a dialog will appear that will let you save it to your calendar. Hopefully you can see the value of the suggestions feature in your daily life. Instead of having to create new contacts (or update them) by copying the info from one app to another, this seamlessly lets you add it without ever leaving the Mail app. 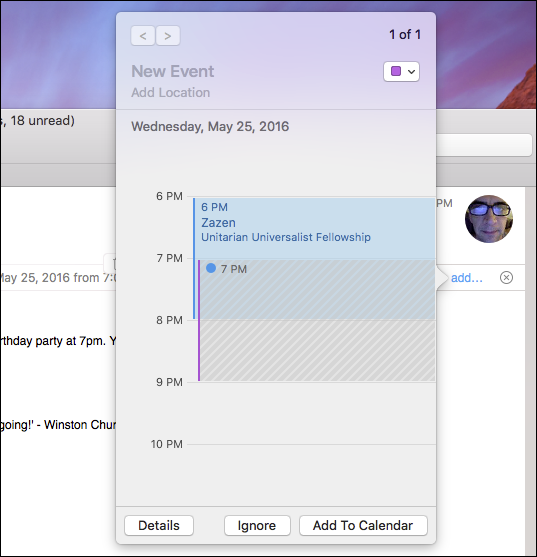 Similarly, if you find yourself often spacing events, you can now add them as soon as they appear in your inbox. This should save you lots of time and effort so now that you know where to look for it and how to utilize it, you have one more method to will help you become more organized and reliable.